Readings: Jer 31:7-9; Heb 5:1-6; Mk 10:46-52. 1/ First Reading: NAB Jeremiah 31:7 For thus says the LORD: Shout with joy for Jacob, exult at the head of the nations; proclaim your praise and say: The LORD has delivered his people, the remnant of Israel. 8 Behold, I will bring them back from the land of the north; I will gather them from the ends of the world, with the blind and the lame in their midst, the mothers and those with child; they shall return as an immense throng. 9 They departed in tears, but I will console them and guide them; I will lead them to brooks of water, on a level road, so that none shall stumble. For I am a father to Israel, Ephraim is my first-born. 2/ Second Reading: NAB Hebrews 5:1 Every high priest is taken from among men and made their representative before God, to offer gifts and sacrifices for sins. 2 He is able to deal patiently with the ignorant and erring, for he himself is beset by weakness 3 and so, for this reason, must make sin offerings for himself as well as for the people. 4 No one takes this honor upon himself but only when called by God, just as Aaron was. 5 In the same way, it was not Christ who glorified himself in becoming high priest, but rather the one who said to him: "You are my son; this day I have begotten you"; 6 just as he says in another place: "You are a priest forever according to the order of Melchizedek." 3/ Gospel: NAB Mark 10:46 They came to Jericho. And as he was leaving Jericho with his disciples and a sizable crowd, Bartimaeus, a blind man, the son of Timaeus, sat by the roadside begging. 47 On hearing that it was Jesus of Nazareth, he began to cry out and say, "Jesus, son of David, have pity on me." 48 And many rebuked him, telling him to be silent. But he kept calling out all the more, "Son of David, have pity on me." 49 Jesus stopped and said, "Call him." So they called the blind man, saying to him, "Take courage; get up, he is calling you." 50 He threw aside his cloak, sprang up, and came to Jesus. 51 Jesus said to him in reply, "What do you want me to do for you?" The blind man replied to him, "Master, I want to see." 52 Jesus told him, "Go your way; your faith has saved you." Immediately he received his sight and followed him on the way. I. THEME: God always loves people and finds all possible ways to heal their weaknesses. God loves people and predestines for them to live with Him happily and for ever; but many people misused their freedom to blindly chase after worldly illusion. To bring people back, God has to use sufferings which people don’t like them, but necessary. When people are in sufferings, they might recognize their sins, repent and come back to God. They must know that they can’t live a happy life without God. Today readings illustrate God’s love for human beings in many different situations. In the first reading, because the Israelites ignored prophets’ calling them to correct their life and to come back to God, He let their enemies trample upon them. They lost their country and were on exile. During their exile, God kept sending His prophets to encourage them to recognize their sins, to repent and to be firm in hope because He shall liberate and bring them back to re-establish their country and life. In the second reading, God’s love was expressed through the fact that God chose the high priest among people to be God’s representative between Him and people. The most important and lasting High Priest is His Only Son; Christ is God’s mediator to care for people’s needs through all generations. In the Gospel, Jesus healed the blind from Jericho when he witnessed his firm faith—overcoming all obstacles to ask Jesus to restore his sight. 1.1/ God is merciful after punished the Israelites: As a father who loves his children, but must punish them when they commit wrong doings; God must punish the Israelites after He warned them so many times through His prophets. He let the Israelites fall to the Assyrians and be exiled in 721 BC. However, God promised with them through prophets that He will save the remnant after the exile if they repent. God’s promise was achieved when Cyrus, the Persian king, obeyed God and released the Israelites in 538 BC so they could comeback to re-establish their country and to rebuild the temple. Today passage from Jeremiah was an example of God’s promise to the Israelites: “For thus says the Lord: Shout with joy for Jacob, exult at the head of the nations; proclaim your praise and say: The Lord has delivered his people, the remnant of Israel.Behold, I will bring them back from the land of the north; I will gather them from the ends of the world, with the blind and the lame in their midst, the mothers and those with child; they shall return as an immense throng.” The remnant were those who recognized their sins and repented, not the physical strong ones who survived during the exile. 1.2/ God loved the Israelites with the father’s love: The Israelited misused their freedom to separate them from God; but God is always loyal to His promise: to love and to protect them when they recognized their sins and asked for His forgiveness. To help them to do that, He must let sufferings happen to them. The prophet Jeremiah recognized the reason of the Israel’s sufferings: “Let us lie down in our shame, let our disgrace cover us, for we have sinned against the Lord, our God, From our youth to this day, we and our fathers also; we listened not to the voice of the Lord, our God” (Jer 3:25). When the Israelites recognized their sins and return to the true love, God continued to care for and to protect them as Jeremiah’s oracle in today passage: " They departed in tears, but I will console them and guide them; I will lead them to brooks of water, on a level road, so that none shall stumble. For I am a father to Israel, Ephraim is my first-born.” Ephraim was the biggest tribe of Israel and many authors used it to substitute for Israel. 2/ Reading II: "You are my son; this day I have begotten you." 2.1/ The human high priest: The author of the Letter to the Hebrews used three important factors of the Old Testament’s high priest to compare with Christ, the most important New Testament’s High Priest. (1) A high priest is chosen among human beings: “Every high priest is taken from among men and made their representative before God, to offer gifts and sacrifices for sins.” The high priest is the representative for human beings before God; for example, he comes to the Holy of the holies once a year, on the Atonement Day, to offer the sacrifices, first for himself and then for the people. (2) A high priest is also ignorant and weak:“He is able to deal patiently with the ignorant and erring, for he himself is beset by weakness and so, for this reason, must make sin offerings for himself as well as for the people.” The high priest isn’t an angel or a saint, he also has sins and weakness as any human being; that is why he must offer the sacrifice for himself before for the people. A high priest must have compassion with the ignorant and erring because he is also full of weaknesses. He can’t be proud of their position to despise or to be angry with people. (3) A high priest is chosen by God: “No one takes this honor upon himself but only when called by God, just as Aaron was.” Priestly vocation in the Old Testament must come from Aaron lineage and be chosen by God. 2.2/ Christ’s role as the High Priest: The author used these three factors to apply to Christ and to point the differences between Christ and other high priests. To understand “a priest forever according to the order of Melchizedek;” we must refer to the passage in Genesis when the priestMelchizedek went out and blessed Abraham when he came back from a victorious fighting (Gen 14:18-20) and Abraham gave back to him one-tenth of all things. (2) Christ has compassion for human beings: Since Christ passed through all sufferings as a human being; he can help people to overcome all hardships in life. The author clearly described this character in another passage, “Surely he did not help angels but rather the descendants of Abraham; therefore, he had to become like his brothers in every way, that he might be a merciful and faithful high priest before God to expiate the sins of the people. Because he himself was tested through what he suffered, he is able to help those who are being tested” (Heb 2:16-18). (3) Christ is the mediator between God and human beings: Christ is the true Mediator of God; he reconciles people with God by redeeming their sins. After completed his mission on earth, Christ established the sacrament of Order to provide priests for people so they can continue his mission on earth. An author described the role of a priest as follows: A priest is the one who prays and unites with God in weekdays and conveys to people what God wants them to do in the weekend mass because people are so busy to earn their living. The presence of a priest helps people to recognize God’s immense love for them. 3/ Gospel: "Go your way; your faith has saved you." 3.1/ The blind’s strong faith: Jesus and his disciples came to Jericho. When Jesus, his disciples and a big crowd went out of Jericho, there was a blind who sat along the sidewalk begging; his name is Bartimaeus, the son of Timaeus. (1) He was blind, not deaf: He must hear people talking about Christ of Nazareth and believed in him. He knew this probably is the only chance for him to be healed so he began to cry out and say, "Jesus, son of David, have pity on me." (2) He overcame all other’s threats: Many rebuked him, telling him to be silent. But he kept calling out all the more, "Son of David, have pity on me." They rebuked him because he was the reason why they couldn’t clearly hear Jesus’ teaching and they despised him because he is only a beggar. His determined desire to be healed helped him to overcome all fear and obstacles to meet Jesus. Do we have a strong desire as his to meet Jesus? Are we ready to overcome all fear and obstacles to come to him? 3.2/ The brief conversation between Jesus and the blind: Hearing his voice, Jesus stopped and said, "Call him." So they called the blind man, saying to him, "Take courage; get up, he is calling you." (1) The blind’s firm and determined desire: Mark described the blind’s determined acts, “When he was known that Jesus called him, he threw aside his cloak, sprang up, and came to Jesus.'' He didn’t want anything that prevented him on the way to Jesus. And when he heard Jesus asked that "What do you want me to do for you?" The blind responded without any hesitation: “Master, I want to see." 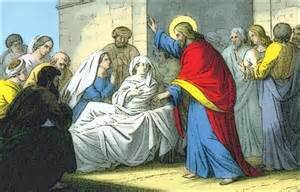 (2) Jesus’ mercy for the blind: Jesus said to the blind, "Go your way; your faith has saved you." Immediately he received his sight and followed him on the way. To follow Jesus in Mark is to become a Jesus’ disciple. The blind was healed not only physically but also spiritually. - Sufferings happen when people turn away from God to chase after worldly delusion. To live happily, we need to return to God who truly loves and cares for us. - God’s love is expressed through His selection of priests among people to be our representatives to reconcile, to pray and to bring God’s blessings to people. - The most wise, faithful and merciful High Priest is Christ. We should be brave to come to him in order to receive forgiveness, healings, and all necessary grace for our life.